As expected Monday, Apple used its annual developers conference to introduce a new version of the iPhone. And while some of the features may have been known heading into this week’s Worldwide Developers Conference after prototypes of the phone appeared in public, Apple still looked to dazzle smartphone users with a number of new features, including a new screen technology, an improved camera, and the ability to conduct video chats. “I think it’s a lot more than people thought it was,” Apple CEO Steve Jobs said of the new phone, which will be called iPhone 4.
iPhone 4 goes on sale in the U.S., France, Germany, the UK, and Japan, on June 24. It will come in 16GB and 32GB capacities, priced at $199 and $299, respectively. Apple will also add an 8GB iPhone 3GS, priced at $99, to its lineup. 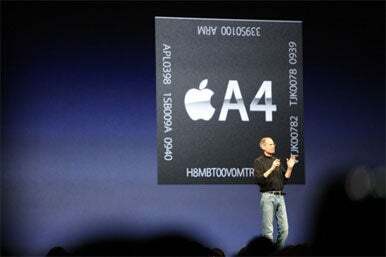 Steve Jobs discusses iPhone 4 specifics at Monday’s WWDC keynote. The phone’s highlights include a retina display screen technology that adds a much higher precision to the iPhone. At 960x640, iPhone 4 offers four times as many pixels as the previous model. The new phone also features a 5-megapixel camera with 5x digital zoom and an LED flash. It also adds 720p HD video capture at 30 frames per second. That improved camera also influences another new feature in iPhone 4—FaceTime, which will allow iPhone 4 users to conduct video chats with one another via Wi-Fi. FaceTime video conference is part of the new iPhone OS Apple will introduce later this month. While Apple’s overview of the OS on Monday covered many of the same details previewed in April, Jobs did unveil a new name for the mobile operating system that runs on the iPhone, iPod touch, and iPad—iOS 4.0. The updated operating system will be available for the iPhone 3G and 3GS as well as the second- and third-generation iPod touch models on June 21 as a free download. Apple kept the focus on mobile apps throughout Jobs’s nearly two-hour keynote. It announced plans to release a mobile version of its iMovie video-editing software that will let iPhone users edit video footage on their phones. iBooks, Apple’s e-reader app for the iPad, is also coming to the iPhone. Jobs announced a new version of iBooks will soon hit the App Store, offering support for PDF documents as well as the ability to highlight text, add bookmarks, and create notes. WWDC is Apple’s annual get-together for software makers and developers. Apple says 5,200 attendees are at this year’s week-long event, which sold out in a record eight days. The conference will feature more than 120 sessions and 120 hands-on labs for Mac and mobile device developers.